The first Cyrpiot Young Lawyers Awards were held at Nicosia Hilton on 27 April 2018 where the winners of the 9 awards were announced. 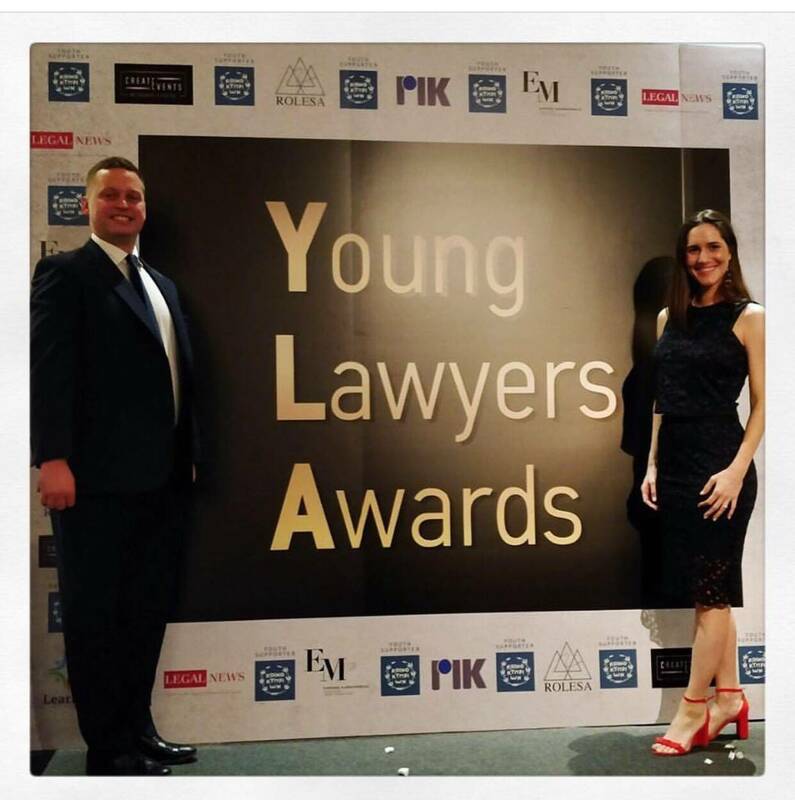 The Young Lawyer Awards were established to acknowledge and reward the exceptional work of young lawyers who excel in the face of an ever-increasing competitive legal market. These awards recognised young lawyers within a variety of different legal sectors, such as public sector and private sector. Legal News Cy and EM Law Firm. The organising committee, Michael Polak and Diana Constantinide, members of Church Court Chambers and Çagil Özsoy member of the Özsoy Law Firm delivered this bi-communal initiative, which brought together young lawyers from across the island. The awards included speeches by the Mayor of Morphou Mr Victoras Xatziavraam who welcomed the initiative and highlighted the importance of YLA to become a tradition. Followed by the President of RIK1 Mr Thanasis Tsokkos who commented on the bi-communal initiative and applauded YLA brining island’s legal communities together. With a speech by the renowned lawyer Mr Rikkos Mappourides who spoke about the difficulties young lawyers are facing as well as presenting the awards to the winners Best Trainee Lawyer, Best Trainee Lawyer in the Private Sector and Best Trainee Lawyer in the Private Sector. The large crowd also heard from the founder of LearnX, Mr Shamit Manilal who was one of the sponsors and introduced an online learning platform for the trainee lawyers in Cyprus, called Ixion. The Awards were attended by the British Deputy High Commissioner, Mr Ian Whitting, respected businessman, lawyers, professors and district judges. The awards were decided by a professional panel and given solely based on merit to commend those most deserving for their ingenuity and hard work, distinguishing them from their competition and proving them worthy of recognition. This year Young Lawyers Awards recognized nine categories of winners. Best Trainee Lawyer: The Winner of this category was Avraam Koutalianos, who won among 7 nominations and is currently undertaking his training at L. Papaphilippou & Co LLC. Best Trainee Lawyer in the Private Sector: The winner of this category was Christos Skiakallis, who won this award after performing exceptionally in his role as a Trainee Lawyer in Banking and Corporate Law. Best Trainee Lawyer in the Public Sector: The winner of this category was Kiriakos Tikkas. Kyriako’s active participation as an intern at the Ministry of Foreign Affairs and Parliament. Best Young Lawyer: The winner of this category was Alexandros Theodotou who outshone the competition given his work doing including civil and commercial and the fact that he has been running his own law firm since 2015. Best Young Lawyer in the Public Sector: The winner of this category was Stefani Theodotou who noticed for her loyalty to the public sector. Best Young Lawyer in the Private Sector: The winner of this category was Koukounis Nikolas who has showed a great commitment in the highly challenging area of construction and building contracts for George Koukounis LLC. Best Young Public Interest Lawyer: The winner was Zafeiro Kastanou who has multiple engagements with European projects, newspapers and organisations like Red Cross. Best Cypriot Lawyer Abroad: The winner was Aleksia Solomou who currently works as an Associate Legal Officer at the International Court of Justice and focuses on human rights and arbitration. Best Law Student: The winner of this category was Antonia Michailidou who is a young leader at a Commonwealth level. Her academic interests focus on immigration law and abuse of women and she studies at UCLan Cyprus. We look forward to the 2nd Annual Cypriot Young Lawyers Awards in 2019. Sponsorship opportunities are now open for Young Lawyers Awards 2019, please email us at info@rolesa.org for more information about our sponsorship packages. We look forward seeing you all next year to celebrate exceptional young lawyers in Cyprus.